AAVIX AGT1321 is a versatile, self propelled, gas powered, push behind mower that offers almost all solutions to your mowing requirements. 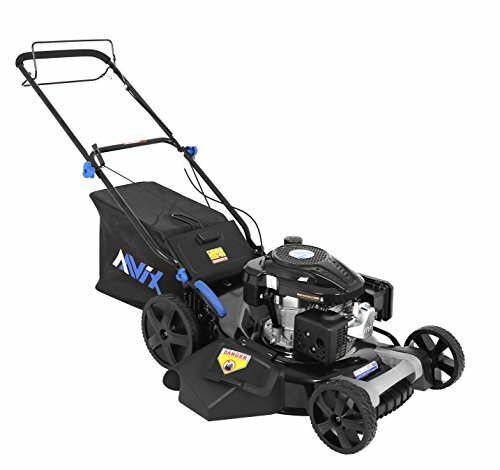 AAVIX AGT1321 159CC Self Propelled 3-in-1 Gas Push Lawn Mower, 22"
This is an all black classic rugged looking lawn mower with a touch of blue here and there to highlight a few parts. The mower has a steel built and is durable enough to last you for many seasons. The 84lb self propelled lawn mower has 7” front wheels and 12” rear wheels. The power from the engine is partly transferred to these large rear wheels for propulsion. The AAVIX AGT1321 has a Loncin 159cc EPA3 engine. The gas mower boasts of a 22” wide cutting deck which is around 1” wider than standard decks in the market with eight height adjustment positions. The height of the deck can be adjusted between 1.25” and 3.75” with the help of a single lever located on the right hand rear wheel. There is a large 60lt nylon grass catcher that aids in bagging the grass clippings. The self propelled lawn mower has all three modes of clippings management viz. Side discharge, rear discharge or bagging and mulching. There is a plastic cover on the right side that facilitates side discharge and does not allow the clippings to fly all over the place. A single large adjustable and collapsible handle aids in guiding the lawn mower across the field. The lawn mower also has an integrated deck wash port for easy cleaning. Having a very basic and traditional look less importance has been given to comfort and hence you wouldn’t find any kind of cushioning in the handle to take care of those vibrations that result from the purring of this highly powerful engine. There is a certain amount of flimsiness associated with the handle. Though in AAVIX AGT1321 self propelled gas mower, most of the work related to moving the lawn mower across the yard is done by the engine and you have the task of only guiding it through, but even then a more comfortable handle could have made quite a lot of a difference. The handle has a steel built and wouldn’t give away easily. The handle can be easily folded and collapses into the deck for compact and easy storage. The large rear wheels along with the self-propelling feature does not pose any problem using this lawn mower even in uneven terrains. The tires resemble the tread of your car wheels and boast of an exceptional grip and increases the maneuverability of the mower. There is a reliable handbrake attached to the handle bar that allows the operator to stop the operations as and when required. The self propelled mower is powered by a Locin 159cc four stroke engine. This gas powered engine is extremely powerful and can start off with the single pull of a cord. The gas tank is quite substantial and can power the engine even for large yards and there is no need for constant refilling. The next feature in this mower that attracts a lot of attention is the 22” cutting deck. The single blade 22” cutting deck ensures that there is no loss in the cutting width and provides a precise cut everytime. The wide cutting deck also calls in for fewer passes and hence the overall time utilised in finishing up the job is considerably low. The height of the deck can be adjusted easily with the help of a single lever. The height ofAAVIX AGT1321 mover can be adjusted at eight preset positions between 1.25” and 3.75”. The lever adjustment is pretty easy and less cumbersome than two point or four point lever systems. The clippings generated from driving the mower forward can be mulched, bagged and side discharged according to your choice. The integrated deck wash port is another interesting feature that aids in self wash and makes the maintenance easy for you. The rear and the side deflect guards prevent the clippings and debris from flying all over the place while the essential hand brake on the handle bar allows you to control the engine actions and wouldn’t ask anything uncalled for. The AAVIX AGT1321 is a decently featured self propelled gas powered lawn mower which has its share of disadvantages as well. But most of the cons can be easily done away with and none of them pose a real threat in the job. This not so expensive mower has a lot of features to its credit including the self propelling feature that takes off a lot of strain from the operator and will leave you with a well groomed lawn in a short mowing time.